We examined the transmission of RNA silencing signal in non-transgenic tomato and tobacco scions grafted onto the tobacco Sd1 rootstocks, which is silenced in both NtTOM1 and NtTOM3 required for tobamovirus multiplication. When the non-transgenic tomato scions were grafted onto the Sd1 rootstocks, RT-PCR analysis of the scions showed the reduced level of mRNA compared with that before grafting in both LeTH3 and LeTH1, tomato homologs of NtTOM1 and NtTOM3, respectively. siRNAs from both genes were detected in the scions after grafting but not before grafting. Further tomato scions were inoculated with Tomato mosaic virus (ToMV) and used for virus infection. They showed very low level of virus accumulation. Necrotic responding tobacco to tobamovirus was grafted onto the rootstock of Sdl. RT-PCR analysis showed low level expression of both NtTOM1 and NtTOM3 in the scions but siRNA was detected after grafting. When the leaves of scions were inoculated with ToMV or Tobacco mosaic virus, they produced very few local necrotic lesions (LNLs) while the control scions did many LNLs. 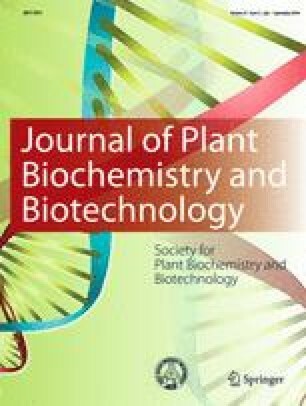 These results suggest that RNA silencing was transmitted to non-transgenic tomato and tobacco scions after grafting onto the Sd1 rootstocks and that virus resistance was induced in the scions. The online version of this article (doi: 10.1007/s13562-015-0334-6) contains supplementary material, which is available to authorized users. We are grateful to M. Ishikawa Y. Tamaki for providing Sd1 and Y. Sato for the tomato seeds, respectively. We also thank H. Takahashi and D. Murphy for the CMV-Y isolate and its cDNA clone and for checking the English in this manuscript, respectively. This work was supported by the Program for Promotion of Basic and Applied Research in Bio-oriented Industry (BRAIN), the Technology Research Promotion Program for Agriculture, Forestry, Fisheries and Food Industry, the Ministry of Education, Culture, Sports and Technology of Japan [Grant-in-Aid for Scientific Research for Scientific Research (C), No. 24580065] to MN and the Japan Science and Technology Agency for the A-step (Adaptable & Seamless Technology Transfer Program through Target-driven R & D) to MN.